Crawford County peach farmer Robert Dickey has been named the 2019 Georgia Farmer of the Year. A fourth-generation farmer, Dickey manages approximately 1,000 acres of peaches and 3,000 acres of timberland with the help of his 90-year-old father, Bob Dickey, his wife, Cynde Dickey, and their son and daughter-in-law, Lee and Stacy Dickey. After high school, Dickey’s father encouraged him to pursue a business degree, so Dickey enrolled at the University of Georgia, graduating in 1976 with his bachelor’s degree. However, banking jobs were scarce, so Dickey returned to the farm with a new perspective. When he noticed other peach farmers were planting more acres, and Dickey Farms’ production volume left the farm’s packinghouse sitting underutilized during the season, Dickey began to offer packing services to meet other local farmers’ packing needs and to generate additional income. The peach trees are still planted in traditional rows, but the areas between the rows are intentionally maintained in sod. This environmentally friendly practice prevents soil erosion, provides traction for farm equipment, adds organic matter to the soil, improves soil moisture and provides habitat for beneficial insects. Following recommendations from the U.S. Department of Agriculture’s Environmental Quality Incentives Program (EQIP), Dickey reduces scale on his peach trees by using oil instead of a chemical treatment. The farm engages in crop rotations with a local row crop farmer to improve soil fertility and structure and reduce compaction. The farm business recycles all of its cardboard, newspapers, plastic and glass through the local recycling center and makes a point to also recycle all pesticide containers, oil and tires. Dickey has taken the farm into new areas with ideas from his children and insight from his wife, Cynde Dickey, the farm’s chief financial officer. She was instrumental in starting the farm’s retail business and mail-order operation, which began 25 years ago. Dickey’s peach crop is marketed through the Genuine Georgia Group, a sales and marketing team with an interest and deep roots in the peach business. Daughter-in-law Stacy Dickey promotes the farm’s market through social media, employee training and advertising. The Dickeys’ daughter, Marjie, a 2013 graduate of the UGA College of Agricultural and Environmental Sciences, develops new recipes for the farm’s bakery. School groups often visit the farm for educational field trips, which are now in high demand. Son Lee Dickey manages the farm’s food-safety program and the installation of new peach trees and new crops, like 100 acres of pecans and 2 acres of strawberries. The farm plans to expand its vegetable acreage to meet the local school system’s demand for Georgia-grown produce. Greer nominated Dickey and his farm for the Farmer of the Year award. He is also a board member and past president of the Georgia Peach Council, has served as president and treasurer of the National Peach Council and is a member of the Georgia Agricultural Commodity Commission for Peaches and the Georgia Agribusiness Council. 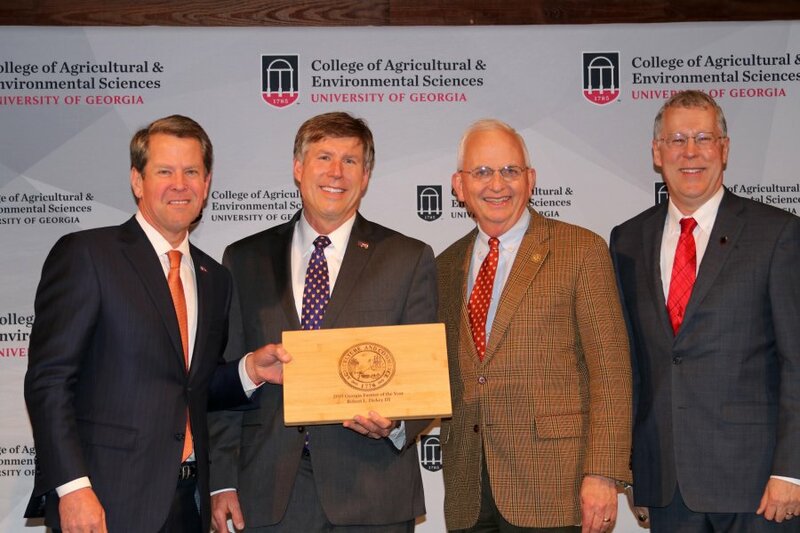 Dickey will now compete against farmers from Alabama, Arkansas, Florida, Kentucky, Mississippi, North Carolina, South Carolina, Tennessee and Virginia for the Swisher Sweets/Sunbelt Expo Southeastern Farmer of the Year Award.